The chaos star, like its three-dimensional sibling the chaosphere, is the most widely recognized symbol of chaos magic. Although sometimes conflated with other symbols of eightfold symmetry, such as the Star of Ishtar and Icelandic Galdrastafur, the chaos star itself is a work of fiction: inspired by the compass rose, author Michael Moorcock designed the Chaos Symbol (as he called it) in the 1960s, to represent the metaphysical forces of Chaos in his fantastic stories about Elric of Melniboné. Since then, borrowing from Moorcock, the symbol of chaos may be found in books, games, album art, etc. The minimum furnishing of a temple whether convened in an open or closed space is the eight-rayed star of Chaos prominently displayed. This may be presented in the form of a banner or altar cloth, a chaosphere, or by the star mounted on a staff. […] The ring of the order is silver and bears an eight-rayed star of Chaos. 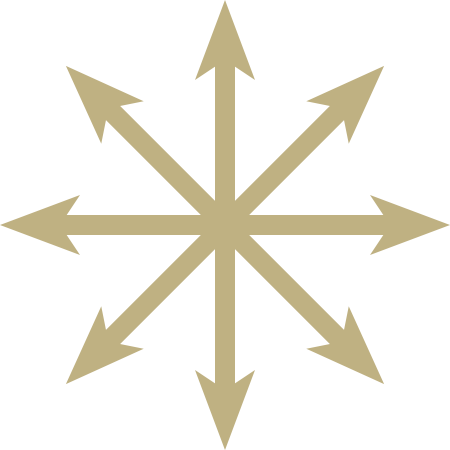 Recently, the chaos star has been appropriated by the Eurasianist movement and some of its affiliated organizations. The IOT North American Section wishes to make it clear that we are unequivocally not associated with any kind of fascist, nationalist, or jingoist movement. Chaos magic represents a system of profound creativity and liberation, and is contrary to any ethnopolitical agenda. While taking a bit of fiction and charging it with real power is exactly in line with chaos magic, it seems silly for organizations founded on “tradition” and “historic” nationalism to represent themselves by a symbol so obviously rooted in modern fantasy.